We’re delighted to present our new range of professional cleaning services. Our flexible and specially trained personnel are available at times to suit your requirements and are capable of delivering a wide range of services from standard office cleaning to advanced industrial cleaning. Daily office cleaning is a cost effective alternative to directly employing staff, buying cleaning tools and products. We take away the headaches that it can bring like trying to cover sickness and holiday absences. We guarantee you an uninterrupted service providing staff daily, weekly or fortnightly working to a cleaning plan you create. Whether you require short term cover or longer, we have a flexible contract cleaning solution to suit your needs. We allocate local cleaners who are flexible and able to work after office hours as well as during the weekend. We specifically train our cleaners to your site requirements ensuring we deliver service excellence every day. Our office cleaning service includes dusting all desks, office equipment, dusting surfaces, vacuuming/dusting chairs, cleaning skirting boards, emptying bins, cleaning floors, cleaning kitchen and bathroom/toilet areas. We can also include monthly window cleaning, specialist floor and carpet cleaning. We understand business cleaning requirements change, and that is why our contract cleaning services are FLEXIBLE. You decide when you need us and for how long and we will create a plan that meets your unique requirements. It’s that simple! Whether you require short term cover or planning long term, we offer cost effective solutions with the added benefits. Try Our initial 3 month trial which can give you the additional peace of mind to ensure you are completely satisfied with our cleaning services before you fully commit. If you are looking to move from an existing service provider then our comprehensive service packages may meet your requirements. We can offer schedule cleaning programmes that include periodic Deep Cleaning, Floor Maintenance and Window Cleaning ensuring all areas of your business are catered for and well presented at all times. Our Management Team will support and advise you every step of the way to ensure the handover is smooth and stress free, including TUPE transfers of existing staff. As a Safecontractor, wellbeing and safety is paramount. Therefore prior to any contract commencing, one of our Manager will visit your site to conduct a full safety/work assessment. We will then prepare the contracts works pack for your approval. COSHH Data Sheets (for chemicals used in cleaning process) •PAT Testing Certificates (relating to required equipment) •our team will then undertake a Site Specific Induction before getting underway with the cleaning project. We can make a difference. Call us today on 0800 083 1090 to arrange a free, no obligation consultation and quotation. In order to ensure a safe working environment for students, as well as a pleasant and positive one, thorough cleaning must be carried out on a regular basis. At Impact, we provide school cleaning services that are suitable for educational facilities of all sizes, whether it’s a small primary school or a large secondary school. Our skilled staff are fully trained and able to provide cleaning services that are tailored to the needs of your pupils and staff alike. From desks and canteens to toilet facilities, we can ensure that all areas of your school are cleaned effectively and hygienically. Our contract cleaning services are tailored to meet your requirements and convenience, and we can proudly guarantee to match any like for like quote for our services. If you would like to know more about our services Please email or call 0800 083 1090. Residential and Domestic cleaning services operate on a daily, weekly, fortnightly and monthly basis to suit your needs. Wherever possible we use the same cleaner to ensure a truely personalised cleaning service. Vacuuming, polishing and washing all floors and surfaces Dusting and polishing furniture, ornaments and work surfaces Polishing mirrors and pictures Wash inside windows and sills Cleaning kitchen appliances microwaves, fridge/freezer, cooker Filling/emptying dishwasher Making or changing beds Laundry service to include washing and ironing Cleaning and sanitising all bathroom facilities Removal of rubbish Option of a carpet cleaning service. All of our staff will be fully vetted with Enhanced DBS Checks. We provide total washroom cleaning, supply, service and management. Furthermore, by choosing Impact you can be sure that your waste is managed with the utmost care for the environment and dealt with appropriately from collection through to disposal. To all types of commercial premises including shops, schools, nursing homes, hotels, offices, leisure centres, and housing associations. We use the latest methods and technologies to deliver outstanding results. Methods and technologies used include Water-fed pole system, rope access (abseiling), mobile elevated platform and traditional ladders. Using the most efficient and appropriate method after initial assessment of the job in hand, ensures that Impact can deliver the most cost effective solution to your cleaning requirements. All our uniformed staff are professionally trained to the highest standards and are fully qualified in all aspects of health and safety. We are also fully insured for your peace of mind. First impressions are important and clean windows will enhance the appearance of your premises. 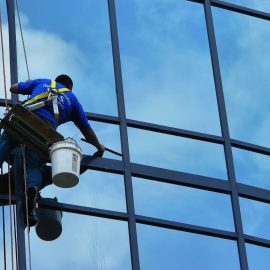 Whatever the size of your building, large or small, single storey or high rise, you can rely on Impact for all your window cleaning needs. Builders Clean simply means ‘an initial clean’ after construction or renovation works are complete. Our team are fully trained and We can also provide other project-based cleaning services – Welfare Facility Cleaning, Deep Cleaning and the final Sparkle Clean. Working with both Commercial and Private Clients, our teams can ensure your project is completed on time and on budget. As an accredited Safecontractor all work is carried out to a specified brief and H&S compliance. We are Fully Insured. Impact industrial cleaning believes in investing in our staff. 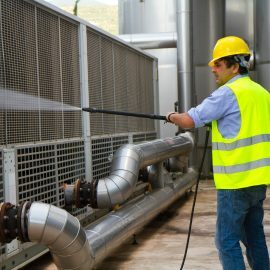 Training includes the safe use of industrial cleaning equipment such as scrubber driers, rotary buffers, steam cleaners and pressure washers. The health and safety of our staff and customers is of paramount importance. For all contracts we create site specific Risk Assessments and Method Statements. COSHH Data sheets are also provided, as well as copies of our Health & Safety Policy. We are an industrial cleaning company that uses on local industrial cleaners.